When we bought our pop up camper, we had been looking on Craigslist for quite some time for just the right deal. I wasn’t quite sure what I wanted in a pop up, but I knew one thing — I did not want a Coleman with an ABS roof. We obviously threw that right out the window when this little Coleman Santa Fe came along. Because our Santa Fe was in such fabulous condition for the price, we jumped on it. I had read horror stories about the Coleman ABS roof situation, but I was confident we could head off any problems. What is an ABS roof? Well, in the mid-90’s, Coleman had this fantastic idea to make a one piece, ABS plastic roof on some of their higher end pop up trailers. The idea was good, no seams for water to leak in, etc., but in reality, the ABS roof didn’t hold up on most trailers. The sun really dried them out, and there was some severe cracking and delamination on many campers. Coleman had to replace quite a few roofs. The pop up camper division of Coleman/Fleetwood eventually went out of business, and now it is impossible to have your roof replaced. Seems like a deal breaker, right? I thought so, too. 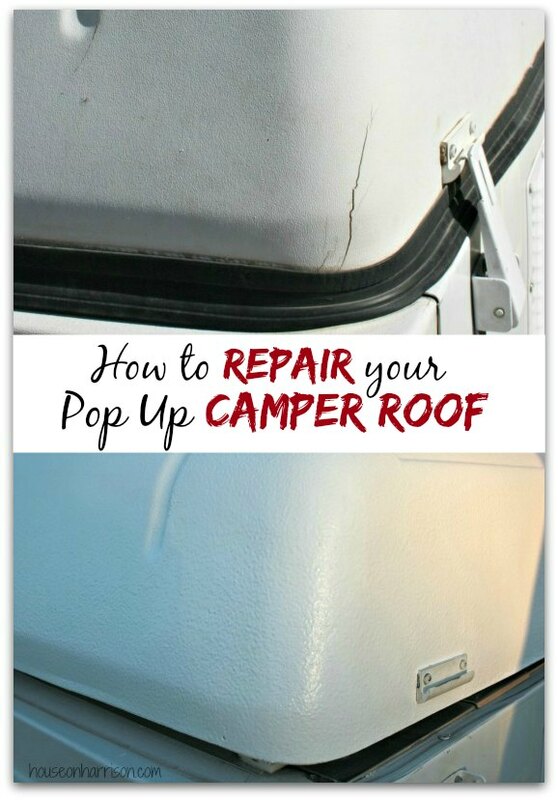 After a lot of research, though, I realized that you could still repair that ABS roof, and, in many cases, the owners of the repaired Coleman ABS roofs were happier with the results than had they gone with a traditional pop up camper roof. We had minimal cracking in our ABS roof. There were a couple of medium sized cracks on one corner, a few small hairline cracks along the lip of the roof, and some spidery cracks under the awning rail. After a lot of research, we decided the best method for repairing the roof, and preventing further cracking in the future, was the ABS MEK patch method, followed by a good coat of UV protectant bedliner. The Pop Up Portal was an invaluable resource for all things repair related, and there is a good amount of information there about the MEK repair method. If you have a pop up, and you haven’t checked the Portal yet, you are missing out! So, what is the ABS MEK patch method? Mr. TypeTwoFun started out by drilling a small hole at each end of the crack. This is supposed to help keep the crack from spreading. Then he used a cutting wheel to clean out the crack. He wanted a nice clean surface for the patch to adhere to. Now, I don’t have a picture of the next step, because the stuff Mr. TypeTwoFun used to patch the crack is pretty toxic. He had to use a respirator when he was applying the stuff. We basically took equal parts of MEK (Methyl Ethyl Ketone) and white ABS plastic pellets and mixed them together in a glass jar with a lid. MEK is a solvent that breaks down plastic, and it is pretty dang toxic. Make sure you wear gloves and a respirator when handling it. You can buy ABS pellets on eBay, but we just took white airsoft bb’s, which happen to be made of ABS plastic, and used them. It takes about 24 hours for the MEK to melt down the plastic, but then you’ve got a nice liquid patch for your cracks. Wipe down the cracks you are patching with a bit of MEK on a clean rag. The MEK will eat into the plastic a bit and give you a nice surface for your patch to adhere to. Use a Popsicle stick or paint stirrer to patch your cracks and then let them dry. Again, use the respirator and gloves when working with your MEK patch “goo.” Once you’ve got your crack patched to your satisfaction, you can sand it down a bit with some fine grit sandpaper or steel wool. 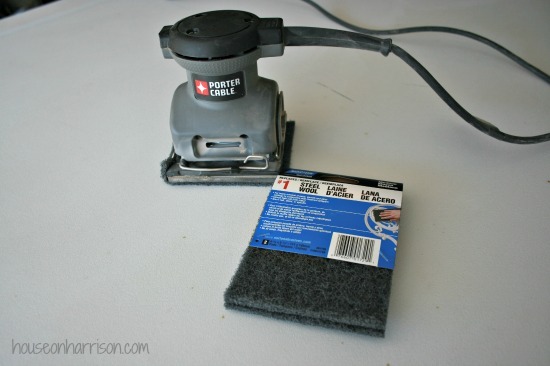 Once we had all of our cracks repaired, we used some steel wool pads in our sander to sand the whole roof down. We wanted to make sure that we had a nice clean surface for our bedliner paint to adhere to. It’s a little hard to tell from the picture, but when you sand, it will leave your roof looking a little dull. That’s what you want. Make sure the whole surface has been sanded evenly. We then used drop cloths and painters tape to protect the areas we didn’t want to paint. Once you’ve got your camper taped up, you can don that hot respirator again and break out your MEK. You want to wipe the whole roof down with MEK. We used clean, old t-shirts cut into rags. Make sure you protect your hands with gloves and check them periodically for holes. (The MEK ate through Mr. TypeTwoFun’s gloves!) 🙁 Once your roof is wiped down, it should shine like you see in the picture above. Now you are ready to paint on your bedliner. We used a product called Grizzly Grip, which can only be purchased online. It is supposed to be incredibly durable, and it is a favorite product among Coleman ABS owners. We purchased the 4×8 kit in Snow White. Our camper is approximately 6.5′ x 8′ and we had PLENTY of product to finish the job. We actually had about half a jar left over. This step was pretty toxic, too, so I stayed away. I did manage to snap a picture of Mr. TypeTwoFun finishing up the first coat. The paint goes on with a foam roller, and you want to apply a light first coat, wait 2-4 hours, and follow with a heavier top coat. Same rules here — gloves and respirator — and don’t get it on your skin! It is supposed to cure within 24 hours, but ours was still tacky 24 hours later, so make sure to allow for plenty of dry time. Remember that corner crack from before? You can’t even see it anymore! The roof looks amazing. It’s now bright white, and it looks brand new. The spidery cracks underneath the awning rail are gone, too. You can see that the Grizzly Grip did leave a slight bit of texture, but I don’t really mind it. It seems strong, and I am hoping it will last the life of the trailer. When we went to put the seal back on, we discovered that it had shrunk quite a bit. We tried everything, but couldn’t get it back on. In the end, we had to buy a new seal. We purchased it from colemanpopupparts.com and the new one went on pretty easily. We wiped down the lip of the roof with some acetone to make sure we had a clean surface for the new seal to adhere to. The new seal had a tape adhesive on one side, and we just gently peeled off the backing and tapped the seal into place with a rubber mallet. Then we cranked the roof down all the way to keep the seal in place while the adhesive cured. Hi, We have a 2001 Santa Fe and our ABS roof is actually in pretty good shape but I’ve noticed a few hairline cracks about an inch to an inch and a half starting to appear. I’m trying to decide if this approach would be worthwhile as a preventative action since we’d like to keep our popup for several more years. I am anxious to hear how yours is holding up though I know its only been a few months. I’m hoping this is an actual long term repair rather than a cosmetic band-aid though I suppose you could repeat this every few years as required (yuck), Also, was it necessary to remove and replace the seal rather than just masking it off? Thanks for any advice, and great site btw! -Brian. Amazon has better pricing on the gasket. I just ordered one for our 1998 Coleman! Hello, just wanted to add my experience. When I bought my 2001 Sante Fe I wasn’t familiar with the ABS roof problem but was soon engulfed with it. The cracks were very small at first but quickly grew and were soon so big that the roof was peeling off. I live in Florida and heat was not kind. My BIL just pulled the crumbling shell of a roof off and sprayed 2 coats of Rhino Liner. He did tape off the seal but soon after the seal started to shrink, its time was up. I guess it’s been about a year and a half and the roof is holding up great. Because of the texture it is hard to keep clean, I can live with that. We purchased a seal from ebay for around $130.00 and am currently waiting for it to be delivered. I saw some posts on popuportal about installation and it looks easy enough. Good luck with the seal. Ours was super easy to install, and I’m glad we spent the extra money to do it. I am about to order the Grizzly Grip. Which would you recommend for the Coleman Pop-up: the course or the fine Grizzly Grip? Did you drill the ends of the hairline fractures like you did the big ones or did you just clean out the crack with the ritary tool? 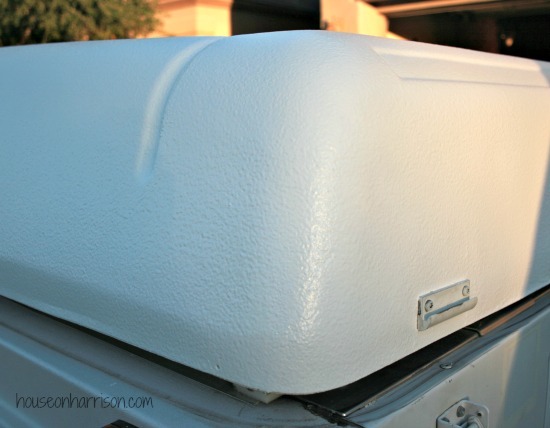 My Coleman Cheyenne has a crack near the hinge of the cargo box and around one of the cargo box clamps. Thinking of trying out this method to fix those along with a few hairline fractures in main roof. Thoughts or suggestions? My storage box was really cracked up behind the hinge. I used the fiberglass body repair kit from Autozone and it’s super solid. Nice and ugly yellow/brown, but will be using the Gorilla Grip to get a nice match to the roof. I have found your post very informative and it has given me a new desire to try a “secound” attempt to repair our niagara elites roof. First attempt we took it to a repair body shop the owner said he knew how to weld abs plastic back together after spray painting it with a Bed liner product called U-Pol $1000 later it looked like your photos after yours was completed. About a year later all the cracks came back with a few more additional. It looks like the final solution would be you must repair it using the MEK method. I had read post prior to the U-Pol treatment about the MEK but most people just poured it in the cracks making a mess of the roof seeing pix of the projects they completed it looked terrible. Looks like the conservative filling of the cracks works best..
My son is taking the camper to the smokie mountains for spring break hopefully no addtional damage will be done from that trip and I will schedule it for a vacation in May. I’ve heard about the U-Pol Raptor bedliner, Rick. We had thought about going that method because it can be sprayed on. Ultimately, rolling on Grizzly Grip just seemed easier, so we went that route. We are getting ready to use the same method to repair our front and back ABS panels because the roof repair went so well. How long after the MEK paste is applied to the crack before it can be sanded? Mr. TypeTwoFun says it let it sit overnight. Depending on how thick your goo is, you may be able to sand it within a few hours. It will depend on how thick your goo is, Joe. My husband left ours overnight (about 12 hours) and it was perfect. Yours may harden slower or faster depending on your mixture. Hope that helps! I have 1999 Coleman Pop Up Camper (Niagra Grand Touring) We are replacing the seal today actually thanks to all of the comments and reviews from this site. The post above were so helpful! I just have one question though… Is there anything else that we could use to repair our roof besides the MEK? My dad is a painter and he thinks that he might be able to use something else to repair the cracks in the roof. Any suggestions? I tried using FlexSeal based on the recommendations of two people that have used it (albeit for different purposes). That was a big mistake! The FlexSeal itself has started to crack, worsened the cracks in my roof, and is discoloring to yellow. I think the MEK ABS method is really the only way to go. Now I just need to get started! 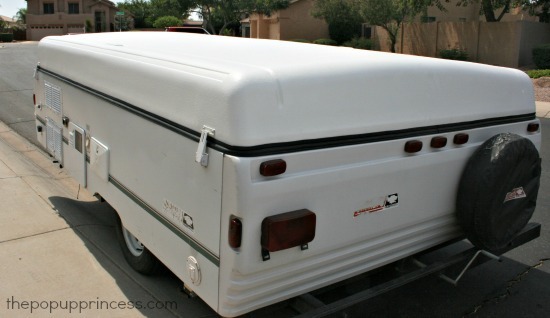 Last year I purchased a 1999 Coleman Fleetwood Niagara, when I saw it I was excited to see a popup that’s canvas was in excellent shape I failed to really inspect the trailer. Not that I regret purchasing it because the price was well below market. Before we even took it out for the first time we had a dealer inspect and repair the electrical, gas and plumbing lines… seems the previous owner thought using household plumbing would be adequate. This Winter we had the flooring repaired. The only thing left is the minor cracks in the roof, the roof seal and the crack along the front storage compartment. I have found your post extremely helpful. My question is what type of ABS pellets should be used (grade, color, quantity)? The crack in my roof looks like the size yours was and the compartment crack is almost the entire length. I had plans on purchasing a new roof seal and applying the Grizzly Grip this winter but would like to fix the cracks now. What are your thoughts about separating the repairs? We just used white airsoft BBs for our ABS/MEK goo, Lori. I’ve heard of people using Wendy’s spoons or ordering ABS pellets from eBay. If you are covering with Grizzly Grip, the color won’t really matter. The smaller the pellets, the quicker they’ll dissolve in the MEK. We mixed it at about a 50/50 ratio, but Mr. TypeTwoFun would check the goo periodically and add more pellets or MEK to get the consistency he wanted. Great post and great blog! How much MEK and ABS Pellets did you need to make enough for the patched area in your photo. I have an area about that large that needs repair. Thank you! We just made sure that we mixed the ABS pellets and MEK at a 50/50 ratio. I think we started with about 1/4 cup of each. Mr. TypeTwoFun kept playing around with the consistency, and so I’m not exactly sure how much it took to cover the cracks. I’d err on the side of more–better to have too much than not enough. It’s relatively inexpensive anyway. I have a 1997 coleman with the ac mount in the center of the roof. We have been plagued with cracks and serious sagging due to the weight of the ac unit. Last summer my hubby sent me off on a camping trip without the usual duck taping of the cracked edges. The wind caught the roof as I was traveling and peeling it back like a banana! Before I noticed the damage while driving, I had a huge piece of roof flapping in the breeze….my husband says junk the trailer. What a shame because everything else still works great! I can now see the inside rubber of the roof. My thoughts are to take the entire top coat off and have it all professionally sprayed with a bed liner, the re-attach a new piece of base trim. Our trim had rotted and cracked, so it was taken off the trailer prior to my trip, which caused the whole banana peel fiasco! What is the purpose of salvaging the top coat of the ABS (?) plastic when it as fragile and brittle as an egg shell? Any thoughts out there? I hate to junk it…..I love my little solitary camping trips! Yes, the gasket seal that pinches/seals the whole thing together along the bottom. I looked up the site you linked, and saw the seal on there for purchase. The problem we had with the first seal was that it became so brittle over time that it actually separated into 2 pieces. The roof is so warped/bowed at this point that it’s impossible for it to sit flat around the base. It sits like a banana with the outer edges not touching the trailer body as soon as the center does. This amount of pressure caused the rubber trim to break apart. I have debated about using some sort of steel plate to raise the sides of the base body to possibly force it back to it’s original shape without breaking apart a new piece of trim. Honestly, we have been fixing this dang roof since barely 2 years after purchasing it! It has been a repair nightmare, but it’s paid for so I want to find a way to still use it. Thanks so much for the input! What a bummer, Jana. Does your roof have the braces inside? I think they started bracing the later Coleman ABS roofs–especially if they had an A/C unit. When we approached Coleman about the sag, they furnished us with 2 braces and instructions to install ourselves. We did put those in, but the weight from everything has been too much for the roof. the base trim (that you shared the link to) started to break down from the weight and when that was no longer intact, that allowed to roof to settle even lower. hence, the crescent shaped sag. I can force the roof all the way down and still latch it, but the worst sag of course is in the center. Our heavy snow winters haven’t helped, either. I have racked my brain trying to come up with a solution, and after my last trip with the roof topcoat actually peeling back, I came up with the bedliner idea. I am SO glad to know other people have done that, too! Coleman only guaranteed the roof for life to the original purchaser. We got ours used like you did, so we were stuck. Your info has been so helpful!! Thank you! I purchased a 1999 Coleman westlake several years ago. The pop up had no cracks at the time of purchase. I bought a cover fo it and with in two weeks of having the cover on it the camper roof bubbled up, cracked and delaminates. After an extensive search on line I decided against repairing it and decided to replace the entire roof. The reaso for replacing it was I read several posts online that said that I might spend all the time and effort repairing the areas where it was delaminates and cracked only to have it do the same thing in other areas. The moral of the story is do not use a cover with ABS as it traps to much heat and the glue bond releases the ABS from the foam roof. I removed the entire roof and then sanded down the foam to remove the glue. I then installed two layers of fiberglass mat. After the fiberglass resin dried I once again sanded down the entire roof. Once the roof was to my liking I applied gorilla grip. I purchased a new roof gasket from eBay for $130.00. The roof is now strong enough to stand on. I just purchased a set of yakima 60 inch roof tracks to mount on the camper. The tracks will allow me to install bars anywhere along the 60 inch track. I also purchased a mega warrior basket with extension to hold gas cans, firewood etc. I also have a kayak and bike rack. The final result is a very strong and water tight roof that is capable of supporting a roof rack. I just thought I would share my ABS roof replacement with you all so you would know that there is an alternative to just repairing the ABS. Could you please list the material you used, and where you got it from. My biggest concern, is that I will order the wrong stuff, and it will melt the foam roof! This is an awesome, permanent fix! This is what I did to stop the roof from sagging. I used unistrut, and it is straight as an arrow now. Are you removing your ABS shell from the roof, Jeff? I don’t have specific experience on that, although a couple of readers here have done it with excellent results. I’ve just never done it myself. Most people use the Grizzly Grip in Snow White, fine texture, which is what we used. I heard that it will collect dirt on the surface of the grizzly grip over a short time frame. Is this true? Jeff, we’ve had Grizzly Grip on our roof for over a year now with no problems. You may have a problem with dirt if you use the course texture, but the fine texture cleans up well. We took it from Arizona to Montana and back last year, and the camper collected a lot of dirt and debris from the trip. We hadn’t repaired the body panels yet at that point, and when we cleaned the camper, the roof washed up better than the aging ABS plastic body panels. We haven’t had a single issue with the Grizzly Grip, and I am so glad we did the repair. I am looking to do the same repair to my 1998 Niagara. How difficult was it to strip the entire abs roof? Any techniques you can recommend? Hey April, Hi Larissa, I’m wondering how the Rhino liner is holding up. I had cracks I was going to repair but I have found considerable delamination and more severe feathering under the awning rail that what Larissa had. I am thinking it might be easier just to peel it all off and seal with the Rhino liner. Not sure how to remount the awning rail or if that will be come more obvious once I peel the ABS back. Any thoughts. I would remove the ABS plastic if you have severe delamination, Brit. If not, you’ll have to glue it down–and that can be difficult. I have heard that the awning rail can be glued back on with Liquid Nails. I haven’t done it myself, but have seen a couple of roof jobs where that was done. 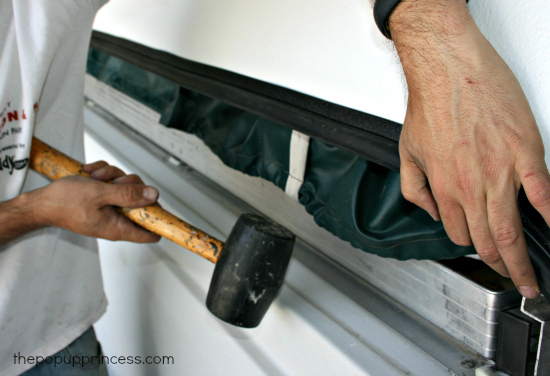 You can also cut around the awning rail and leave it in place. 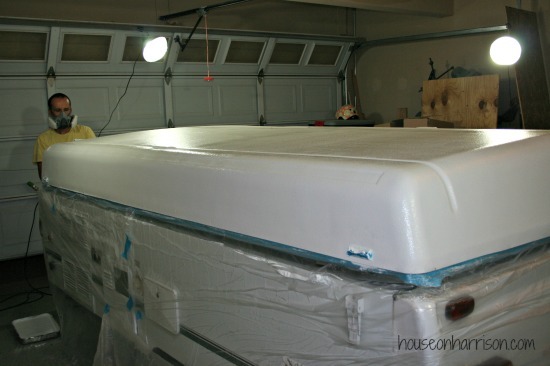 I would love to learn a little more about the process you took to add fiberglass. Did you do two layers of cloth and then add resin all at once or did you do 1 layer at a time. I’ve only done a little bit of fiberglass work (on a surfboard) but I think this may be the method I need to do to get the most out of my camper. What weight cloth did you use? We have a Santa Fe camper. The seal has shrank over the years. You posted you bought a new seal. We have the same camper you have. How much seal did you purchase? Did you measure around the camper top? Have looked at this camper site several times. I am glad I saw this about you redoing your camper. We measured our old seal and added a few inches to compensate for the shrinking. In the end, though, the seal we bought was cheaper when sold in 41′ lengths, so we ended up purchasing that length. We did have a couple feet left over, but it was still cheaper to buy that length than purchase it by the foot. Hope that helps. Love what ya’ll have done, looking to start on ours. I have a lot of cracks, We have a 2000 coleman cheyenne. having trouble finding grizzly grip on ebay, Do you no where on ebay it is located? Hello. I have a 2001 Santa Fe with a crack in the roof that I want to repair. This information has been extremely helpful and I am going to give the ABS/MEK method a shot! My only question is this.. If I don’t apply the Grizzly Grip, will it look really bad? I am thinking about only doing the patch of the crack and sanding it down but I don’t really want to do the 2nd part which is applying the Grizzly Grip over the entire roof. Is that a bad idea? Could I possibly just use the Grizzy Grip or a regular gloss latext paint over the patched area only? Thanks! Are you using a plastic syringe? I’d be nervous about that, because MEK is made to dissolve certain types of plastic. Second, do you have any delamination? If your ABS is pulling away from the foam roof underneath, you’ll have to address that before you attempt to repair the cracks because you’ll have air pockets underneath the ABS shell. You want your “goo” to be about the consistency of Elmer’s glue. Mr. TypeTwoFun used a Popsicle stick to drizzle it down into the crack. Once the crack was filled, he would use the stick to spread the goo flat. We never had any issues with air bubbles at all. Hope that helps. Angela, how did your camper hold up to removing the whole ABS shell? Our ABS shell is beyond repair at this point. Did you have an AC unit? Our concern is the foam roof will not hold the hardware well and it will end up falling apart. I have also read comments of other sites, that the berliners will “eat” the foam, did you notice any deterioration? Thanks in advance!! I had my camper closed up 2 years and when I uncovered it, I notied the roof has a medium L-shaped crack in the corner as well as the seal is falling apart. I took it to the shop and they opened the camper up and some mice had made theirselves at home. The shop said they could fiberglass the top but it would be very expensive or they could put this specisl tape which would not look very pretty. I had the camper under a tarp all the time but they said they believed that some water got in the top and they were concerned the cables would break but I didn’t think there was any problem. There are surface cracks that have not broken through. After reapiring the crack – do you think the Grizzly grip will seal the rook. My goal is to repair the camper and donate it to the Wounded Warriors programs so the can check it out and go out for a weekend to get away. It has worked for us. It’s been over a year since we repaired our roof, and the cracks are not coming back. Do you have any delamination? I saw your before and after photo’s. Where did you get that awning? It looks ;like it’s telescopic. Our roof cracked, fiberglass, and the RV shop said they could repair it based on what you did. Saved us a bunch of money. Nice! Did they use the same method? I just came across this while looking at common pop-up repairs. Spot-on advice Larissa! We use MEK for metal surface prep and stop-drilling sheetmetal on military aircraft routinely and yes it does stop the crack from continuing so long as you find the very ends. Another famous example, the Liberty Bell! If I can offer a helper hint with regards to injecting MEK slurry under the ABS; MEK turns foam/plastic to muck on contact and injecting it would dissolve the roof foam creating additional cavities under the cover. 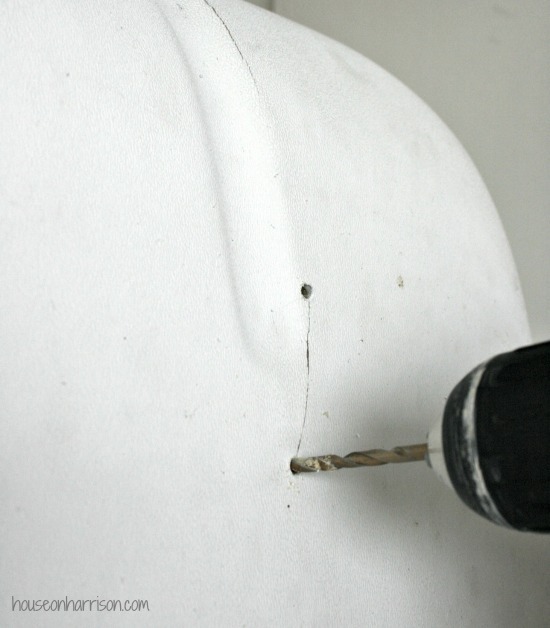 If the cover is separated in spots, drill the smallest hole possible to squeeze silicon or foam safe glue into the gap. If you drill a slightly larger hole in a thin piece of plywood and place it over the repair, aligning the holes, and add a small amount of weight, the plywood will distribute pressure across the area and help force excess silicon/glue up through the hole. Clean off the excess that squeezes out, let it cure, apply the slurry, and paint. Cheers! Craig, could you please explain the addition of silicon before MEK procedure? The cracks I have in one area are a bunch of Zs next to each other and some ABS pieces between the Zs are very loose and I could probably pick them out. I know in this area I will have more than just a crack to fill, more like a square centimeter, and do not want to apply the MEK/ABS paste to the foam under the roof if it is just going to create a larger and gooier mess. Actually, I just went out and looked and may end up with quit a large rectangle to patch in this area. Most of these cracks seem to be starting under the awning attachment grove if anybody has any experience fixing these, please help? We have basically followed your process described here to fix extremely similar repair on our Coleman Westlake ABS roof. We added a strip of Eternabond tape over our MEK repairs, though, under the awning rail as an extra preventative measure, hopefully. We are now doing the Grizzly Grip. Do you know during your GG application if it seemed ‘patchy’ after a coat was applied? The top of our camper roof seems like some areas still look wet and smoother and other areas look dryer and more textured. Just not quite what I was expecting. Possibly my husband just laid down more on some areas than others with the roller. Or maybe he went over areas with the roller after it was starting to dry and made it ‘nappier?’ Just hope it’s all going to dry looking the same in the end. My dad, brother, and I just went in together on this same make and model. I spend TOO much time on DIY projects and doing DIY research. I’ve seen countless forums, youtube videos, webpage after webpage after webpage. I LOVE yours. It is incredibly helpful. Keep up the good work, and keep DIYing!!!! We have a 2000 Coleman Utah, our roof has just a few small cracks along the edges and a couple of bubbles starting on top. Out main problem is the for has lost some shape and doesn’t meet the side body properly anymore. Are you familiar with this at all? Thank you for sharing your experience. Do you have an A/C unit, or is you roof sagging in the middle at all? I don’t think I explained that very well. I know we have some delamination beginning on the top. The problem I am trying to explain is that when the trailer is closed the side of the roof on the kitchen side especially and a little at the trunk the entire roof edge sticks out farther than the side. Therefore the gasket is not meeting the side of the body. We worry about water if it storms when we are on the road with it. Is seems like the sides are spreading out some, not just the outer layer. I wish I could send a picture. We do not have an A/C unit. We bought the trailer new in 2000 and have enjoyed it very much. I haven’t seen this before, Stacie. Do you happen to have a picture? I will try to get one. How do I send it to you? Hi Larissa! A short time ago I wrote to you on a different thread about my pop up. Recently I had to take it to an rv shop for some repairs. Before I did I gave it a mojor cleaning inside and out. That is when I discovered the cracks. They are hair line cracks about 1 to 1.5 inches long leading up from the bottom edge of the roof along the sides. In your story about how you repaired your roof, you drilled and ground out the large corner cracks before filling with the MEK mixture. My question is how did you repair the small side cracks… did you use the same method as the large ones? I want to make sure I make the repairs right the first time. The small side cracks are the only issue with the roof but I want to catch it before it gets worse. Thanks for your help and again, great site! We repaired the small cracks the same way, Mark. Small cracks can quickly become large ones if you don’t stop them from spreading. It’s a big pain, but we definitely recommend drilling out all the cracks and patching them. You’ll be happier with the results in the long run. Thanks for the reply Larissa! I kind of figured those small cracks had to be repaired the same way but I didn’t want to create more work for myself if I didn’t have to. I guess I had better get busy. I have a camp site reserved for October 1st! Thanks again! I am looking at a 1998 Coleman Casa Grande with roof issues. When I went to look at it, it was set up so I couldn’t see the roof. I asked the owner about it and she said “there is a small crack that I have taped up and it doesn’t leak. other than that there are no problems.” Well, when I went to pick it up the roof was down and the small crack was about 3 times what she described. Plus the whole top is warped. I have called two RV places and they both told me to walk away and find something else because the cost of repair wasn’t worth it. (I left it there that day because the owner didn’t close it up correctly so the slide wouldn’t close tight) I am supposed to pick this up tomorrow at 5:00 p.m. but I am struggling because I really love the camper…except for the roof. Does the warping mean that the whole outer skin should be removed? I am not extremely handy and since I don’t have a significant other the repairs will be up to me. If anyone can offer any suggestions I would appreciate it. Thanks. Oh, and there is a slight sag in the roof as well. No evidence of water damage anywhere inside though. If you are patient, the right camper will come along. No need to settle for something that isn’t worth the money. It took us a year to find our camper, but I love it, and I’m glad we waited. Thanks for your story and instructions. I am almost complete on my Grizzly Grip restoration. I have a 97 Coleman Cheyenne with a significant amount of cracks. Everything went well with the project except for the supplied roller broke apart after completing half of the first coat. I believe I need to thin down the product before using. I luckily had a few spare regular foam rollers to complete the first and second coat. I ordered more than I needed of the Grizzly Grip so I plan to add a third coat. I did use the Airsoft BB’s to make my ABS Goo and I used Acetone to melt down the pellets. I was unable to locate MEK in my local stores. The roof delamination was minimal so I drilled holes into the bad spots and squeezed in gorilla glue into the area and placed a weight over the area. After I sealed the hole with ABS Goo. Again, Thanks for your instructions and I hope my comments will reassure and help others with their project. Well I did what your blog stated and got me some airs oft bbs melted with mek in mason jars overnight… made 3 jars with 10000 bbs … only needed 2 jars… boy that stuff is toxic! Definitely for anybody doing this method to buy a really good resporator! Lowe’s or home Depot have them for about 35 to 45… worth it! One thing I did notice was after the cracks dried… I began noticing new ones before I applied the liner… didn’t know if that happened to you…. My roof was severely cracked with big and small ones to include everything to the front of the ac was delaminated. So I used a cutoff wheel and basically cut off the top -leaving the sides intact- and used the mek to help bridge the gap between the foam and the existing top…. 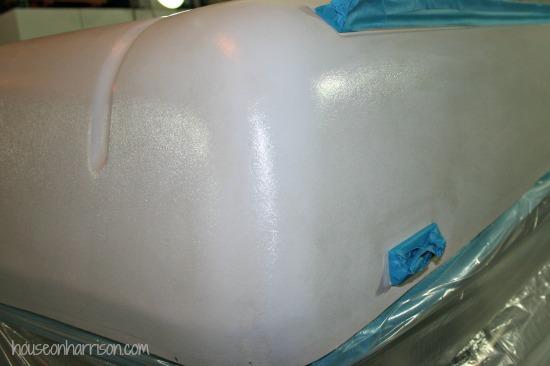 I used the t Rex 2000 spray liner… just took 12 bottles to cover the entire top and trunk lid… worked great just a few over spray spots I’ll deal with in spring when I add a roll on liner over the top just to get it thicker where I cut off the original top. Replaced the delapitated junk ac cover with a max air replacement cover and it looks like new… just hoping now it holds…. was wanting to attach before and after pics but can’t figure out how…. Hey Joe, how did the AC hold up? Is it still attached after a few camping trips, this is my main concern that the hardware and AC will cause more damage to the foam. Thanks!! We too got a great deal on a Coleman Westlake camper and the roof need some repair. I did not notice how bad the roof was until we got it home. I tried using Flex seal but I did not have much success with it. The Flex Seal just made a mess and started to crack again. When I saw this posting I tried the ABS MEK repair and I have to say it looks great and worked great. My roof had a few more issues then what yours had. I had to use gorilla glue to re attach parts of the roof were it had cracked before applying the ABS gue. But with the roof all sanded and the Grizzly Grip applied the top looks like new. Thanks for the Tips. Hello Larissa! I’m am fixing my roof on my 1999 Coleman Santa feb and I purchase the abs roof seal From Colemanpopupparts.com. The question that I had was did you guys use any other adhesive or glue on installing the seal to the roof,or if you only use the the tape adhesive it comes with? Thank you and I hope to hear from you soon. 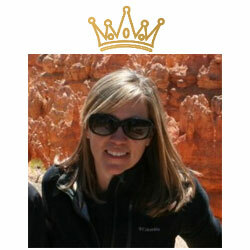 Hi Larissa, I LOVE this blog! I have a 96 Coleman Shenandoah with an ABS roof. The roof has started to cave in and is cracking pretty bad. I’ve been researching how to repair it myself since they don’t make the roof braces anymore. My husband has been pushing me to get rid of it because he thinks its an eye sore, although our family has really enjoyed using it in the past. I had almost given in and then I found your blog and now I am super motivated to fix it up!! I had no idea it had so much potential!! Now, my roof is definitely worse than yours. I know we first need to brace the roof and then fix the shell. Can I send a photo to see if you or your readers have some advice as to the best way to do this or tell me if it’s too far gone? I have a similar but different problem and was wondering if anyone may know from personal experience how best to fix my problem. I have a 2004 Fleetwood Laramie with an Aluminum roof with ABS plastic mounted to 1/8th inch plywood that has delaminated from the Aluminum roof. Has anyone used the Gorilla Grip liner to seal one of these Aluminum roofs successfully? I have seen a different bedliner material applied to Aluminum and it didn’t stick, which is why I ask. Also, I am considering using the #12 delaminating epoxy to reattach the ASB/plywood ceiling back to the roof, I am also not sure if this will work as I don’t know if it will stick to Aluminum. I have contacted both manufacturers for there expertise, but I thought I wood ask here also if anyone had any insight as well as to let you all in my project. Any words of wisdom is appreciated! Thank you for this site, it has been very helpful thus far. Hi, I read the Q&A about only repairing the cracks and saw that you highly recommend the grizzly grip coating for UV protection. My question is can I apply the GG as a spot treatment vs a full roof paint job? It just seems like a big job… I’d love to find a way to only repair the small cracks instead of doing a full roof makeover. Also, have you heard of MEK and marine grade 5200 mixture? It’s supposed to create an excellent “goo” as well. Thanks for the amazing blog. I Wish I could hug you in thanks for all these great ideas!!! I have not heard of the MEK/5200 mixture. I’ll have to check that out. I suppose you could spot treat your roof, but it wouldn’t look very pretty. There is a definite difference in color and texture between the Grizzly Grip and original ABS plastic. You’d be able to see spots all over your roof. You’d also defeat the purpose of the UV protection. You want to give the entire roof a good coat of GG to protect it from the sun and prevent the need for further spot treatments. Nice fix! I’ve been repairing cracks by plastic welding , but will need to give this a shot. I’ve been welding ABS for a long time , but change is good. Thanks for the idea. We recently purchased a 1997 Coleman Niagara. The roof is in comparable condition to yours in the rood repair write up… with maybe few more cracks. Thank you for the detail I which you posted. Any chance of getting an “18 Months Later” follow up? If it is still going strong, it may be the first project we tackle. Thanks again for the teriffic write up. Our roof repair has held up really well. My only advice is to drill out and fix every little crack. The Grizzly Grip will fill all the cracks, but they will reappear if you haven’t repaired them to begin with. 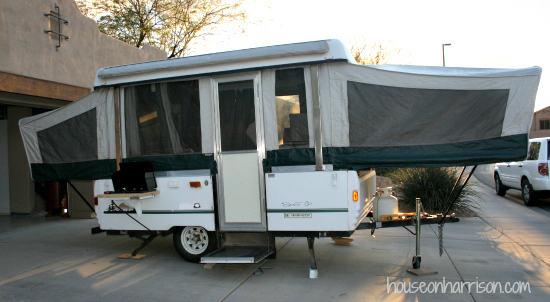 Hi my husband and I are thinking about purchasing a 2000 Coleman Mesa pop up. I wanted to see how your repair was holding up. How long ago did you repair your roof? When you mix the beads and mek how big of a glass jar did you use and did it make enough product? And do you close the lid on the jar while it is melting? I would love to hear back from you !!! THANKS! We have the exact same camper. I plan on doing the roof repair with Grizzly Grip. Do you think that the 4×8 kit is enough to do the roof and the front ABS panel? I’m wondering if the mek good ends up getting hard like the ABS roof? I tried starting this project yesterday and put some MEK goo on a test area and 24 hours later it is “dry,” but soft. What I mean is, it isn’t sticky or tacky or anything, but in the cracks that I opened up, if I press with my finger nail, it indents. Its not hard like plastic. Should it be? I’m at a loss right now and now sure what to do. PLEASE HELP! Hi we own a Sante Fe just like the one you have worked on. We need to replace the floor inside and one of the walls on outside needs to be fixed as well. We had this same problem with our roof although ours was cracking so badly that we ended up having to take the outer shell off. We painted a product called Duck Coat on the fiberglass. While it does not leak at all, it proceeded to bubble and looks hideous. LOL I was wondering if you knew of anyone who had taken their outer shell off and was able to possibly use the Grizzly Grip to recoat the fiberglass?? Or any other ideas? We have used it this way with the bubbles for one whole season and just took it this past weekend on a trip too. Once again no leaks but just looks bad. Would like to fix the look of it if we are going to keep it. I actually have heard of several people removing the ABS shell when the cracking is severe. They seem to have good results with the Grizzly Grip over the foam roof. You may need to call Grizzly Grip, though, and find out if you need to remove the Duck Coat. How difficult would it be to remove it? Does it peel off pretty easily? We just bought a Colman the previous owners took all the abs off the top and now it’s just foam. There is a rather large Crack in the foam that starts on the side and goes on to the top. How do I fix the foam that’s cracked? This is just a shot in the dark, but maybe try taping off the crack except for the ends and shooting some “Great Stuff” foam gap filler (you can buy at Home Depot or Lowes) in the crack. You may need to put something heavy down along the tape as the foam expands, After the foam cures you can sand it down flush. Just a thought. Hey Larissa! Wondering if you know if this method will repair Apache hard sided pop up trailers? 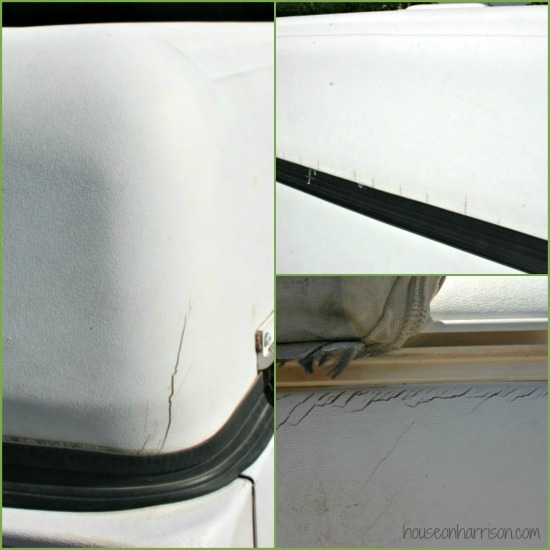 We just bought a 1976 Apache Royal and the roof has some fine cracks…. I think covering the entirety of the roof after fixing the cracks would look really nice, so wondering if this method is a possibility…thanks! Larissa, thanks for the great instructions!! I just want to make sure of one thing before I mix the MEK and the ABS plastic. My camper has about 6 major cracks that are 1-2 feet long and about 15 additional hairline cracks that are 6 inches to a foot long. Your instructions say “equal parts of MEK and pellets.” Do you recommend 2 cups of each or more/less? It honestly depends on how thick you apply the goo, Mark, and how wide your cracks are. We did a mix of 1/4 cup each, and had more than enough goo to cover the small cracks that were on our roof. It keeps well, so if you are in a hurry, it might be best to err on the side of too much rather than having to wait another 24-48 for a new batch to be ready. Thanks for the quick reply! I was going to use 2 cups of each, so I’m glad I have the right amount now. 1. Buy at least two 9″ rollers from Grizzly Grip. You want to have a fresh roller for the second coat. I tried to use the old roller and it quickly disintegrated. In fact, I’d buy 3 rollers “just in case.” I also bought 2 4″ rollers but I didn’t need them. I did the entire task with the 9″ roller. 2. My MEK/plastic mixture lasted over 3 days. I was able to go back to the jar more than a few times and reapply in areas that I missed or in areas where the wind blew the mixture back out of the drill hole (I applied the MEK/plastic mixture outside). By the way, I mixed 1 cup of MEK with 1 cup of ABS plastic and I had a little left over. 3. I have an 8X10 camper, and the Grizzly Grip customer service rep was able to tell me exactly the amount to purchase. The Grizzly Grip arrived in two 3 quart containers (with a bottle of accelerator for each). As I applied the first “thin” coat, I started to worry a little that I was using too much. I ended up using almost an entire 3 Quart container on the first coat. But the second “heavy” coat did not require as much of the “paint.” I also bought the snow white color and it looks great! 4. They say this in the Grizzly Grip instructions, but you don’t want to push hard on the roller when you apply the Grip, especially at the end of a painting session. You’ll start to get flecks from the roller in the paint, and it’s almost impossible to pick out. 5. I bought a pair of heavy-duty rubber gloves (specially made for applying caustic liquid) from our local “Big-R” to apply the MEK/plastic, to wipe the camper top with the MEK solution, and to apply the Grip. Worked like a charm. Thanks again for your outstanding instruction! We have a 1998 Coleman Cheyenne, it had spider cracks like yours did when we got it but we did not know about the ABS problem someone before us had covered them with a clear sealant so we were not really worried. The our first winter with it there was a bad deep freeze and the entire top cracked open like a puzzle. I made some huge mistakes in trying to fix it. We had gone to a local dealer who repairs campers and he told us to ditch it and buy new, he gave us no hints on how to deal with this. So today as I am looking for other parts and pieces I find your post and I know we have hope. Only now it’s gonna be harder because we have to undo my I love Lucy fixes. Thank you for this post. Hello, love the ideas from your site. I’m going to fix my coleman popup….again. Quick question – did you use MEK or MEK substitute for thew ABS goo? thanks! We used MEK, but I hear MEK Substitute works the same way. I just finished replacing the front storage compartment on my Coleman Utah. Now I am working on the abs body panels and roof using the mek/abs goo repair. My question is when mixing the two products you used a 50/50 solution. Do you leave the glass jar sealed when mixing the two or did you leave it open? Keep the lid on the glass jar, Kenneth. Once the MEK evaporates, you are left with the hardened ABS plastic. If you allow it to evaporate while mixing, you’ll never get a goo texture. I’m starting to prep my pop up to put the grizzly grip on. I repaired the cracks with ABS goop already last week, just need to sand those down. I used my camper this weekend so took it in to the car wash to wash the road dust off and noticed the front top part of the shell has some bubbles in it where the ABS has separated from the foam. There’s no cracking yet on those bubbles. Do I need to open up those bubbles and re-glue them? I was hoping to just roll over them with the GG to save time but I’d also like to fix it up right. Update on my roof fix-it. The ABS patches went well, although the BBs never melted fully, I had soft chunks in my mix. Those would squish out as I applied it and they sanded down just fine. 1) Use a drill attachment paint mixer and mix your GG thouroughly! That’s what I did wrong with my 1st coat, I shook the jug a lot but there was a big pile of stuff in the bottom of the jug. Te 2nd coat was mixed better and went on great! Covered all the badness from coat #1 just like GGG customer service said and looks like its supposed to. 2) The rollers will come apart a bit, unlike my first coat the 2nd coat didn’t cause this nearly as badly. Be prepared to pick a few chunks out, no biggie if the GG is mixed properly. 3) This stuff stinks! Make sure to use a respirator. 4) I put a shallow disposable aluminum pan in my paint pan and it worked great to roll from. The first coat I tried just pouring it on and rolling it around, not the best idea. No mess, no cleanup this way. I was wondering what you di the spider cracks? Or did you all just roll over them? Thanks, and great blog!!! Awesome info! 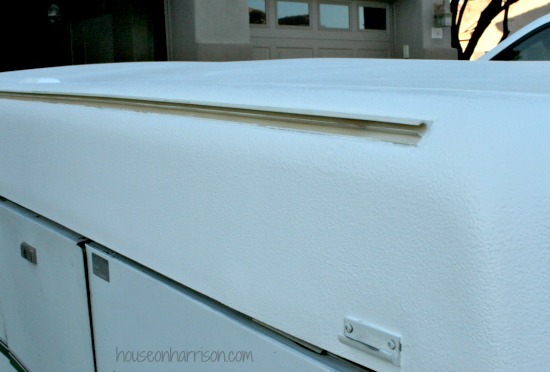 Love this info… Have a ’97 Fleetwood (Coleman) Sun Ridge… Thankfully, no cracks in ABS currently, but absolutely bookmarking your page as a future reference..
Getting ready to do my ABS roof repair!! Is there a reason the repair was done indoors? Do you think it will be ok to do this process outdoors? We were able to get the whole roof off the Santa Fe. The foam is sticky in places. Most of it has a film or coating over it but again there are places that film is missing and the foam is exposed. Also there is glue where previous owners tried to fix the cracks. How to proceed? on the foam? How to remove the glue. Do we wipe the top down with something before the grizzly grip is put on? Any suggestions on how to glue the ABS back to the core where it has delaminated? I have a ’97 Santa Fe. The roof has one big crack on a corner and an assortment of small cracks. I’m getting ready to go to work on it and pulled the seal off yesterday and noticed several areas the ABS has delaminated from the core on the sides. The top seems secure, just the on the sides above the seal in a few places (maybe 18″ long and up 6-8″) Any suggestions how to glue the ABS back to the core? In most areas it isn’t cracked, aside from a few 1-2″ long spider crack at the bottom. I have heard that Gorilla Glue (applied with a syringe) and some heavy weights will do the trick, although I haven’t tried it myself. Have you checked on the PopUpPortal yet? Thanks, yes I have looked at PopUpPortal, and many others. Seems they all prefer Gorilla Glue, just the challenge is how to get it in there. Some say cut slits, some drill holes, etc. I just measured the depth of my delimitation around the edges. One spot, about 3′ long it is delaminated about 8″ up from the bottom edge, but no cracks or defects in the ABS, just no longer attached to the core. They say Gorilla Glue foams and expands, but I can’t weight the side, others talked about bubbles on the top, which would be easy to weight down. maybe just cut the whole section out, spread GG on one part and spray the other and hope for the best – Then coat with Grizzly Grip. I’ve been prepping our ABS top and I was able to re-attach some small delaminations on the side with clear abs glue. I used q-tips to get the glue in the best I could and pressure for 30-60 seconds and it seems to be working very well. We had one large “bubble” about 6-8 inches in diameter on top near the front so for that one I drilled some holes around the perimeter and made one large enough to insert the applicator of a can of Great Stuff foam. I inserted the applicator as deep as I could and withdrew it as I applied foam. Then set a 6 inch square piece of plywood on it and some heavy weights (about80lbs) from a barbell set. the foam has glued and filled the delamination and the Bubble is barely visible. Now onto prepping crack, making goo and applying GG. Our top has too many small hairline cracks so I’m only prepping the large and medium ones. Anyone one with experience on just covering the hairline cracks? Are they still holding up or repairing? I figure if I can keep moisture from getting between the ABS and foam it will help prevent delamination. I’m also using Oatey ABS/PVC clear cleaning solvent instead of MEK since it is no longer available in California. It is a mixture of Accetone and MEK and is available in a 16oz can. I tried a bit with the ABS shavings from prepping cracks and it makes a great goo that adheres extremely well and has set up nearly as hard as the original top and sands well. The more solvent you add the longer it will take to harden. Works best in multiple layers for deep cracks. Great site, good info, looking forward to some feedback! I purchased a 2001 Coleman Cheyenne yesterday that needs a little exterior work. The seal between the roof and the body is not on the PUP. The roof has a few cracks that I plan on repairing, but the cracks are all the way to the bottom. Did you notice if any of the cracks on your roof went below the line of the seal? If so, how did you handle those? We did, John. We just drilled them out as best we could at the top and filled them like the other cracks. Thank you. Did you leave the seal on or did you remove it to patch all of the cracks? Disregard. I just looked through the steps again and saw what you guys did. This is a great site! I had a 1998 Coleman Santa Fe and I tried to fix the roof with the pellets and The MEK thing. But the cracks returned shortly thereafter, it make sense, it the ABS did not hold the first time, why would it work the second time around. The fact that ours was stored outside in the south Florida sun was certainly not helping, I covered the roof with roofing tape ( tar/aluminum tape), painted it with white roofing paint, and that was the end of my problems. It held well for 4 years, then we sold it to a friend 3 years ago and I did not hear any complains yet. Hope this note finds you well and out of harm’s way. I have been following your website for some time now and find it a treasure of ideas. Thank you very much. I have a question that I am sure you have been asked quite a few times. I have a 1999 Coleman/Fleetwood Utah pop up trailer. I am having issues with the ABS roof. Not just cosmetically. ( I have been in contact with Grizzly Grip to get the three cracks sorted out). From front to back, there is a sag in the roof. When setting up the exterior door, I have to push up on the roof in order to secure the top of the door. But now, the roof is not sitting on the outside ledge when closed. It now bulges out the side and pushes down on the exterior light assembly and the exterior electrical outlet. It is tearing the outlet off the trailer and will not be long before it becomes a danger. The other side is okay, well for now anyways. Not sure of the construction of the roof. Do you know how the roof is constructed or can point me in the right direction? It would be nice to buy a new roof, but I think that ship has sailed. I am thinking about replacing the outer ABS shell with 1/4″ Aluminum checker-plate. Not sure if it is even possible and that is why I am asking you for some help. Maybe you or some of your readers have come across the same issue and have found a solution. Our family really enjoys our camper and would like to continue doing so for years to come. Can you help us? It sounds like you’ve got a roof sag. Do you have an A/C on your ABS roof, Randy? Have any braces been installed? Yes, there is an A/C unit on the roof. I would venture to say no to the braces. Getting ready to tackle this, but wondering if you or anyone has advice on whether to remove the rooftop a/c unit first? Would rather not and there aren’t currently cracks at that location. Thanks for a great site! Hey Larissa; Thank you for getting back to me so quickly. Do you know if this “sag roof” can be reversed? I though about the braces you mentioned earlier, but not quite sure where they would go or how they would be installed. Do you know how these roofs/rooves are constructed? Hey Larissa; Thank you for all the support and tips. I believe I am well armed with avenues to travel to sort out my trailer’s issues. I know this has nothing to do with fixing the shell, but we bought a pop up a few months ago and I found one of the outlets didn’t work and when you trace it the wire runs back to where the fridge is and where it is plugged into also does not work but there are no fuses blown. Granted the trailer had a little work done to it but everything else works and seems to be fine, but I was wondering if you knew around how much it would be to get it fixed (03) or would it be cheaper to run a new line to that outlet and put in a college fridge (about same size). I know the propane works because the bottle was from my grill and the stove top works great, but the fridge (pilot) did not light up and keep it running cool. I know there are websites on running proper winterization checks on the propane system for the fridge but should I even bother because of age? Anything would help at this point. Our Fleetwood SanteFe has too many hairline cracks to drill and prep every one so I’m only prepping the large, medium and small ones. Anyone one with experience on covering hairline cracks with Grizzly Grip? Are they still holding up or re-appearing? I also found a great source on Ebay for ABS resin for $10/lb with free shipping. Have you had any further delaminations or just the cracks? I suspect that the delamination occurs with moisture intrusion. I think the moisture intrusion happens two ways: through cracks in the top or from getting into the seal and wicking up in the foam layer (hence the side delaminations. I’ve noticed the foam is dirty under cracks when I’m prepping them for repair. I also noticed dirty foam at the edges where I had a couple of small spots where the side delaminated a bit. At each of those spots I notice that the foam was dirty as I was removing the seal. Fortunately our Santa Fe only has one large bubble and a few very small ones. We have a 1996 Santa Fe that we bought new. 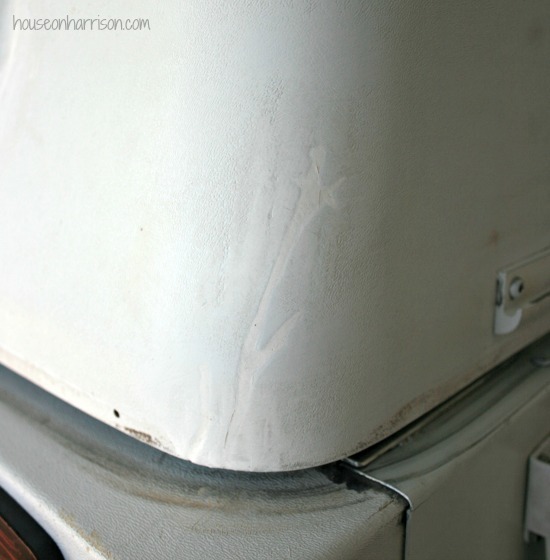 The cracks appeared and we removed our air conditioner years ago to see if that would help. It wasn’t working properly, so it won’t be put back on. Now we are in the process of doing the Grizzly Grip repair and have been considering putting a roof vent fan in the hole where the air conditioner was. Has anyone else tried this? Just curious about the seal you replaced. Is it the roof top seal or the lid seal? Hmmm… not sure what you mean, Stephanie. We replaced the seal that runs around the edge of our roof. 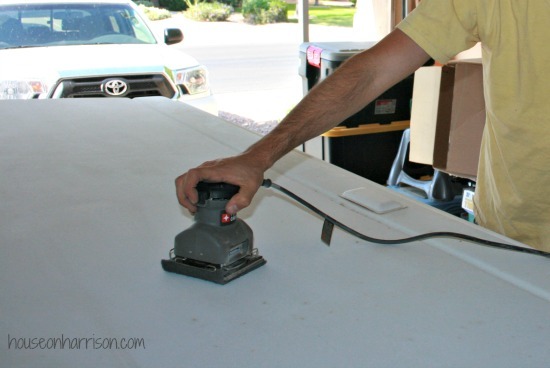 It provides the seal between the camper and the roof when the camper is closed. We had the same problem on a 2003 bayside. There’s no permanent fix. I’ve re-glued all the pieces together with gorilla glue, then tried to seal the cracks with an epoxy. Finally, I’ve applied several coats of cool seal to give it a final coating. Looked great, but sadly, new cracks will appear. Every year I’ve worked on it to use it for the summer. To answer your question. I’ve removed my awning because I was afraid of the stress making the roof worse. Now, I try to cover the roof during the winter months, with a make shift roof, hoping it’ll survive without more damage. Long story short, it’s depressing. My front lid is ruined and I have no idea how to attack that problem without damaging the panels. Food for thought, if you ever look into buying a new camper, when the salesman harps of the wonderful life time warranty on the roof, tell him to stuff it. Warranties means nothing if the company doesn’t honor it; especially when it goes out of business. I adore our ABS camper roof, Peter, but we have the smaller Santa Fe and no A/C unit. We’ve had no sagging or delamination. The roof repair was the best thing we ever did. In fact, we loved the roof repair so much, that we did a similar repair to our body panels. You can find that post here. It’s been several years now since your grizzly grip renovation – how is it holding up? Do you think you need to take the seal off to repair the roof? I’m helping my dad with installing a new seal this weekend, but I wonder if we should do roof repairs first? Yes, definitely take the seal off to do the roof repairs… especially if you have cracks along the bottom edge of the roof. Can the roof and compartment seals be re-glued? The seal on my 2001 Coleman Westlake is separating from the track. I wanted to see if I can glue it before buying a new one. Has anyone used Gorilla Glue or Gorilla Glue Epoxy in the cracks of the ABS before sealing with Grizzly Grip? I see people have used it for delamination. The application seems much easier than the MEK/ABS goo mixture without the nasty toxicity issues. If so, what exact product have been used and has it held up? Found your site a few weeks ago – so MUCH great info!!! I just got a 97 Coleman Santa Fe(my first ever pop-up!) and the roof, other than being dirty and a bit warped only on top, seems to have no cracks(or maybe I haven’t looked close enough). I’ve heard so much about the ABS roof cracking and leaking, I am wondering if I should just coat it with a bed-liner like you used to prevent any from forming? What are your thoughts? Is it worth all the trouble if I don’t have any issues…yet? I just finished my MEK/Grizzly Grip repair on my 1997 Coleman Sante Fe. It worked great. Its not that hard it just takes more time than you expect. A couple of tips. 1) Get a full face respirator (~$70). I have worked with chemicals for many years, MEK is bad news, but with a good respirator its no big deal. 2) Grizzly Grip doesn’t “paint” very good. On the roof I poured it out of the bottle and swiped it around with the brush. With this stuff you have to brush back and forth many times to even it out. 3) Tape and use plastic liberally. I thought I did a good job, that stuff fly’s around off the roller and finds all your open stuff. Also wear long sleeves. It doesn’t do anything to your skin but pull your hair out trying to get it off. 5) Expect to do multiple coats of the MEK goo, it sinks in and you need to do multiple coats. Then use a good sander to level it out. A dremmel does not work. Follow the directions on this post and you will be fine. You can do it, it is worth it. My roof is as good as new. Side Note: Do not neglect your lift system, especially the crank mechanism. Thanks Pop-up Princess and the PopupPortal for all the awesome information and tips. My camper will be like new soon. When you get a respirator get one with active charcoal. @Mike Bitter – did you do any other crack preparation if you did not use a dremmel? We have a larger Coleman popup that was vandalized with a hammer about two years ago and has sadly sat in our garage since. It has large holes (largest is 6×12) where the vandals smashed it while it was in storage. I was wrestling with how to adapt your method for repairing mine after taking it to four body shops that turned me with away with no hope of a fix (fiberglass or Bondo will not work). Long story short, I think I figured it out. I purchased a sheet of ABS from Amazon that was the same thickness as the camper roof, cut the holes into squares with a Dremel, then used strips of ABS as backers against the inside edges of the hole. I cut the ABS to fit my square holes, then used a product called WeldOn (ABS plumbing cement, also on Amazon), to cement the ABS patch to the backer strips and the surrounding ABS roof. WeldOn dries really hard, and while I have not tried to sand it yet, I’m hoping it sands as nicely as your mixture above. Anyway, thought I’d share here in your blog since you inspired this in the first place. If anyone has large holes there’s hope! Hi, All of your information is extremely helpful. I have a couple of questions though. Did you use the cutting wheel on all the hairline type cracks along the side of the top or did you just ignore the small cracks and have them filled in with the gorilla grip? The previous owner put a bike rack on top which I want to get rid of, but there will be 8 large holes in the top that I’ll have to repair. I’m assuming that it would be adequate to put painter’s tape on the inside of the roof while I filled in the holes with the MEK mixture and let it set? No to be the barrier of band news. But my Camper roof repair did pass the test of time. Spring of 2015 I noticed small cracks in 2000 Coleman. I filled the cracks with the MEK method and followed all the intrusions for painting the camper with grizzly grip. The finish product looked great. Fast forward to this summer uncover the camper and found big cracks all over the camper. The roof of the camper is worst off then in 2015. It very depressing to spend all the money and time and two year later in back in the same boat. I currently look for another modification to fix the roof. But beware this mod did not stand the test of time for me. For the ABS pellets and the MEK mixture: is it by weight or by volume for “equal parts”? We measured by volume, Jennifer. I have a 2002 coleman utah pop up camper & I would love to restore it, I’m not rich. Would really appreciate an honest opinion of the cost. The cost of repairing the roof, Rhonda? I think we spent in the neighborhood of $400 with the new gasket/seal and and the Grizzly Grip. It was a little pricey, but definitely worth the work! I’m about to put a new seal on our Coleman Bayside tent trailer. My new seal has an adhesive strip already inside the track. Do I need to add extra glue? or is the adhesive strip strong enough to hold? Has anyone used Acetone to make the ABS Goop/Slurry/Glue mixture INSTEAD of MEK? I am nervous about using the MEK and would rather use acetone if it works. 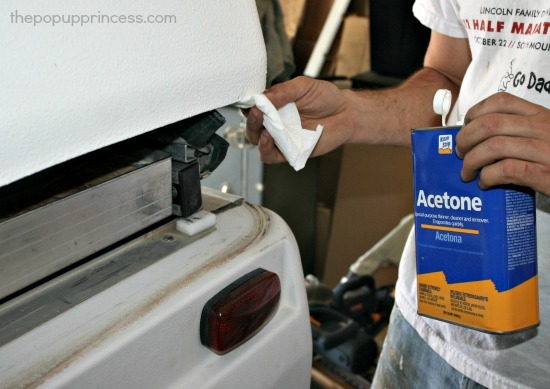 I know that people use acetone to make a slurry for 3D printing applications. I am doing my repair on my front and rear ABS plastic panels that cover my cargo box (front) and rear of camper on my 2001 Coleman Utah. They have several severe cracks and breaks, which has resulted in floor rot. Also, has anyone used any type of filament or mesh behind the cracks to help strengthen them? How has the Grizzly Grip held up now that it’s been awhile since you did the repair? Would you recommend it for long term? We just replaced our seal last year, but the roof could use some replacing. Think we could manage this without taking off the seal again? We just used the adhesive tape that was on the seal. We wiped the lip of the roof down with acetone first. It is still going strong several years later. We issues with cracking and delamination all mixed together. I glued the roof back down by drilling holes in the roof and using generous amounts of extremely strong super glue and then clamping/holding the roof down until glue dried. After this I sanded down the whole roof, wiped with Acetone, and rolled on 3 coats of a white bedliner. Then put on new seals. The seals I used had a metal component to them to help them hold and I used two tubes of 3M weather seal adhesive. After this we camped the roof down and left it for a couple days to hold it in place while adhesive dried. First off sorry for punctuation. 1996 Coleman Tahoe repair. Roof had at least 4inches of sag,cracks all over the sides of the roof especially the corners and under the awning. Fixed sag first, Went to lowes and bought Uni-Strut 8 or 10 feet long don’t remember for sure used the original roof brace for a template. Notched uni-strut then bent and welded to match the angles of original brace. attached them to the lift arms using angle iron. had to drill holes in angle iron to bolt to lift arms and to attach uni strut. then cut other 2 pieces to length of the new braces. ended up having to take the door off the tracks on the roofand notch them for the uni strut and also had to move light and 12 volt plug a few inches. Also had to remove ac unit to lighten the roof to remove some of the sag then made 2×4 poles from the floor to the froof to remove the rest of the sag the attached the uni strut the length of the braces about 4 inches away from the ac hole in the roof. roof now has no noticeable sag. Abs was mostly delaminated so we took it all off. Cut the sides off of it wich left the flat part of the good. Lightly roughed up the abs and the foam then wiped with acetone then used gorilla glue to glue the abs back on the roof. After glue dried lightly roughed top side of roof with a sander wiped with acetone and 2 coat with grizzly grip. That doesn’t sound familiar, Jeff. I don’t recall ours having a rubber barb. Have you contacted Derek @ ColemanPopUpParts? He is usually pretty good about responding quickly. Thanks Larissa. I did email Derek when I posted the same question here. No reply yet. Maybe I’ll try calling him. Thanks for putting such effort into this website, and being so responsive! 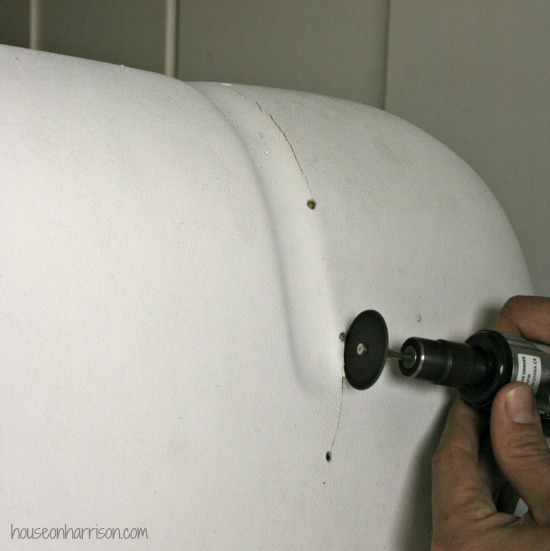 We are currently in the process of fixing the ABS roof on our Coleman Bayside Camper. Can you tell us why do you apply a layer of MEK after you sanded the whole roof, before applying the Grizzly Grip? What is the purpose of this step? Thanks for your insight! We just got our very first pop up this week, it’s a ‘99 10ft Santa Fe. So very happy to have found your blog. What a wealth of information! We have very similar cracks in our roof and the only question I have, so far ;), is how deep are you drilling the holes and the ends of the cracks and what if the crack reaches the edge of the roof? Would you drill at the edge of the roof in this case? Thanks in advance. PS-Very impressed with you checking in on comments years after your post! Thank you so much for this excellent description. I tried it and it worked great. I live in Thetford Mines, Québec, and it worked great. However, I had some air bubble coming from drilled holes. I had to force MEK goo inside them and it was not easy. Maybe I should not have drilled holes for such small cracks. That likely means your shell was delaminating or pulling away from the roof, Philippe. Most people solve that problem by using a syringe full of Gorilla Glue to re-adhere the shell to the foam underneath. I tried many products to fill in the cracks, such as construction adhesive, but it seems like there is a constant flow of air coming from the cracks that I created with a dremel tool, and when the glue is fully cured, I can see air bubbles under the glue. I am thinking about widening the cracks some more, then injecting glue or maybe urethane. I think the cracks would have to be 1/2 inch wide. It is now summer 2018. Do you still have the pop-up camper with the MEK fix? If so, how is the fix holding up? I have a 2002 Cheyenne, just now developing hairline cracks, so I’m debating whether a fix is worth it or if I simply cut and run and sell it for a steal on Craigslist. Basically, is this a long-term fix or a short-term bandage. Love your blog, Would this Grixxlyly Grip work on a star craft roof? I do not believe it is ABS. I am cleaning it and want to just seal the whole roof and brighten it up. Not getting any obvious leaks but it is a 97 and trying to take some preventive measures before it does spring a leak.